I don't know if these are really my top five or not, but I like all these players (at least on the field). I tend to like linebackers too, being a former HS one. Sadly, I think that's representative of the behavior of a lot of professional athletes. In Seau's case, I think it's known that years of cumulative damage left him with CTE. How this condition affected his behavior is a matter of some debate, but he eventually committed suicide, saying in a note he regretted the person he'd become. I've met Charles Barkley twice, once on the street and I didn't even know who he was at the time. He was very nice and struck up a conversation with my wife while we were walking. Seemed like a nice guy. 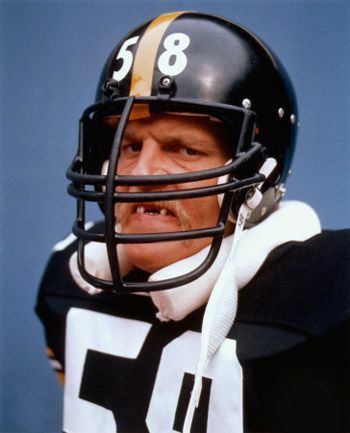 I was a fan of Greg Lloyd during his career with the Steelers, and his playing style reminded me a lot of Jack Lambert -- aggressive, relentless, and a team leader. But off the field, that aggressive nature has apparently been a serious problem for him and it would be hard for me to support him. Daniel Cormier was at an event some years back, before most people knew who he was, and we spent quite a while talking. He was a gentlemen and a professional and just seemed like a nice person. Incidentally, I've met Dana White twice and his personality is exactly like you see him on TV, so no surprises there. Not a sports personality, but years ago I had a run-in with Tom Brokaw which both surprised and irritated the hell out of me. He's obviously a guy who's used to being in charge and getting his way, and he wore out his welcome with me in about five seconds. I don't know if he's always like that or not, but he made a pretty poor impression. I have had the pleasure of briefly chatting with Sir Anthony Hopkins, and he is a rare pleasure and a joy. Brilliant man who really loves life and his enthusiasm is infectious. Never met either. Daniel Cormier is excellent at calling a match. Tell you what to watch for before it happens. Only ever heard that Dana White was not the coolest person to meet. I've seen a couple of professional athletes up close but the crowds surrounding them were too big to bother getting closer. My wife and I ran into Ed Rendell in NY. He just walking down the street. We talked for just a bit and he was very relaxed and did not try and rush away. It helped that my wife loved him ever since he was the mayor of Philadelphia and told him so. Joe montanna, Ronnie Lott, Jerry rice, Lawrence Taylor and Carl banks.